Though still young, Ott’s commentary on the waltzes is often illuminating. Of the A flat waltz, op. 64 no. 3, Ott says, “I don’t take this one too fast. It needs to retain its waltz quality – these are salon pieces, and they must entertain in that style. Virtuosity would obscure the underlying melancholy and longing.” In her view, Alfred Cortot and Dinu Lipatti are the pianists who have come closest to that spirit. She is constantly striving to find “the true smell, the true color” of each one. In a search for authenticity as well, Ott has chosen to play from the autograph manuscripts rather than the more popular published editions. She feels that this helps her maintain fidelity to Chopin’s intentions and aids in finding that unique smell and color for each. 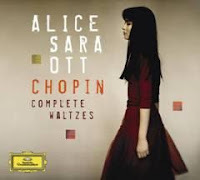 Alice Sara Ott makes her US orchestral debut January 22 & 23, 2010 with Paavo Järvi and the Cincinnati Symphony Orchestra.